President Muhammadu Buhari on Sunday hosted Gov. Ibikunle Amosun of Ogun and the state governorship candidate of the Allied Peoples Movement (APM), Abdulkadir Adekunle Akinlade, at the Presidential Villa, Abuja. Amosun, at the gathering, revealed a letter of adoption of the President by 4PM as the party’s presidential candidate in Feb. 16 general elections. The governor said the endorsement letter was given to him by the party for onward presentation to the president, adding that with the endorsement, President Buhari, whom he called a man with good heart, would receive a huge number of votes in the 2019 presidential elections. 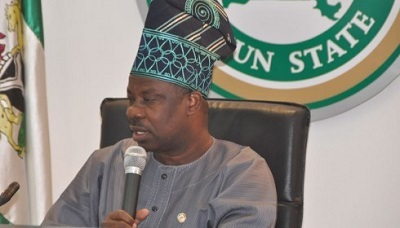 Amosun also spoke to State House correspondents after today’s meeting with the president, promising the governing All Progressives Congress (APC) of the undettered loyalty and support of the government and people of his State to the renewal of President Buhari’s mandate for sustainable future of the country. Akinlade also told the correspondents that he would personally work towards the electoral victory of President Buhari in the forthcoming presidential election slated for Feb. 16. Reports have it that President Buhari and his visitors had a group photography where they all showed the “4 + 4’’ symbol with their fingers, meaning another four years for governing APC in Presidential Villa.